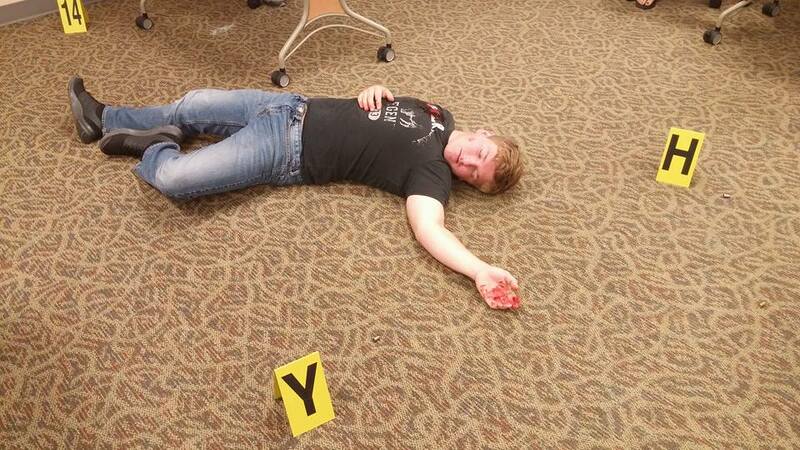 Among the many demonstrations of YES Days, WSCC’s Criminal Justice Club staged a crime scene. Students were encouraged to review the situation, collect evidence and develop plausible motives and culprits. Shown is WSCC Criminal Justice Club Treasurer Daniel Newlen posing as a gunshot victim at a crime scene. The 24th annual Young Engineers and Scientists (YES) Days attracted more than 1,000 people onto the Washington State Community College (WSCC) campus. The YES Days program is designed to get middle school students interested in science and engineering by giving them a hands-on look at how local business incorporate science and engineering into daily practice. More than 100 presenters from throughout the Mid-Ohio Valley demonstrated how science and engineering apply to their careers. During the two-day event WSCC hosted over 900 7th-grade students and their chaperones from several local schools including, Belpre Jr. High School, Caldwell Middle School, Cornerstone Co-operative, Fort Frye High School, Frontier Middle School, Marietta Middle School, St. John Elementary, St. Mary Elementary, Shenandoah Middle School, Warren Middle, and Waterford Elementary. “Demonstrators had dynamic displays and experiments to engage the students to get excited about science and engineering,” said Mary Lou Moegling who has been involved with the planning of YES Days since its inception in 1993. Stations included a crime scene investigation/forensics, texting and driving simulation, insects as a sustainable food source (including free grasshopper taste testing for the brave), polymer creation experiment, and many more. The WSCC’s Criminal Justice Club session included a staged crime scene complete with bodies. Students were encouraged to review the situation, collect evidence, and develop plausible motives and culprits. Daniel Newton, who was part of the presentation and action in the session was pleased with the engagement from the students. “I really enjoyed being able to entertain the students. I could tell that the students were having a great time from the laughter and all the great questions. I would be more than happy to have the privilege to do it all over again,” he said. Moegling reminisced about the annual event and marveled at how the program has grown and evolved. With pride, she explained how many of the presenters at this year’s YES Days had come full circle as “nearly a third of our presenters had been participants as middle schoolers.” Evidence, she said, that the program is making an impact on our community. Sponsors for the event included: AT&T, Chemours Washington Works, College Tech Prep, Family Tree Dental, Kinetic Networking, Kraton, Marietta College Physicians Assistant, MMH Rehabilitation Center, Motorcycle Ohio, NASA Glenn Research Center, Ohio Department of Transportation, Ohio EPA, Ohio OGEEP, Ohio State Highway Patrol, OSU Engineering, OSU Extension Service, PDC Energy, Pickering Associates, Plumbers and Pipefitters #168, Rural Action, Solvay, Southeastern Ohio Oil and Gas, The Castle, Thermo Fisher Scientific, Washington County Career Center, Washington Electric Cooperative, and Washington Soil & Water District.